It does let you learn them pretty shockingly fast. If you aren't used to using your visual memory to memorise things (explained further in Tricks of the Mind by Derren Brown) by yourself, Heisig's own scheme will cut that prior reading/training for you. In fact, Heisig's visuals are by rights more consistent and easier than any you can come up with in the same period of time it takes to read this text.Highly recommended. I was only using this book to learn Katakana, and found the mnemonics unusable. They were the old school unnecessarily complicated sort. I returned this book and used wikibooks.org instead. I was really surprised how good this book was. I tied learning the kana a number of times, by brute force memorization, and it never really worked out that well. I started this book on a Monday, and finished both volumes by that Friday where, on a quiz, I'm getting 90% or higher on remembering these. The images he tries to form in your mind are very helpful, and I like how stuff builds off each other (for example, Fu　フ　Nu ヌ　Wa ワ　Su ス　U ウ　Wo ヲ are presented together because they look similar. Fu is described as a "food bowl". Nu as a noodle falling out of the food bowl. Su as a Soup Bowl, with handles because it's hot. The idea of throwing these in groups is amazing helpful since it clusters what one needs to learn.The only bad thing about this book is some Kana don't include ways of really visualizing it. It's something like "well, we had something like this, if you remember that, you'll remember this." This isn't really the most true, so I kinda wish that assumption wasn't made. Unfortunately, "Remember the Kanji" has a similar issue, but I'll get to that on that book's review once I finish with it.I'm really amazed by this book, and am looking forward to my work in Remember the Kanji. The first part, learning the hiragana, was pretty useful. I managed to learn that syllabary in 4 days (without intense training, just the half hour per lesson). The second part though was a different story. For the first 3 lessons there aren't any useful mnemonics and that's about half of the syllabary. I quit trying to learn the katakana with the Heisig method and learned the rest using other resources and setting up my own mnemonic devices. It didn't help me remember all of the Kana in a few hours, but it helped me remember more Kana than I knew before. Even though some of the imagery, supposedly easy to imagine, make sense some of the time, I found myself more often than not creating other ways to remember. I did learn the Kana, but I wouldn't say the method in this book made a lot of sense to me. I do hope that Remembering the Kanji makes more sense. The Katakana definitely gave me a harder time, so I'll end my short review with a phrase I coined that helped me remember the difference between Shi, Tsu, N, So, and No. Simply Shitsunsono (シツンソノ); has no meaning, but written correctly the movement of your hand should be fluid. I personally recommend learning both hiragana and katakana at the very start of your Japanese studies. This book makes it easier to initially remember the different kana through the use of mnemonics. Then, as you work through your other Japanese study material, your knowledge will be greatly reinforced and solidified. If you're really focused for a few hours, you can get through both hiragana and katakana in a day even (don't do it all at once though... work on it in little chunks throughout the day). I think I took a weekend. Or, you can take a week, or a month. Learning the kana doesn't take that much effort and is well worth whatever effort you do put in. Romaji is an entirely unnecessary crutch that should be avoided. I find it kind of wasteful to only buy a book to just use once for a short while, so I borrowed it from the library. 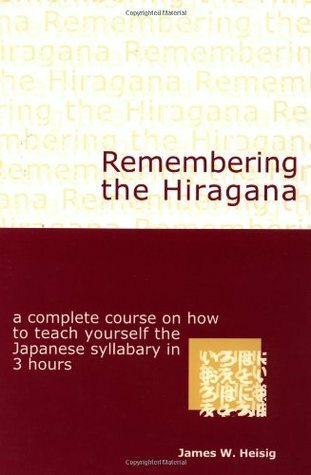 As it happens, I had just taught (or, re-taught, as it was) myself hiragana and katakana before obtaining this book, so I didn't use it for studying the two. Thusly I cannot comment whether Heisig's method is effective of not (and if the mnemonics work, or if you'd be better off making your own when needed, and learning the rest by good ol' repetition).The book is pleasant to look at and gives clear instructions on how to proceed - even when it's a lot of jumping back and forth. Perhaps too much. Excellent. Great method of associating the Japanese kana to things that an adult can remember, rather than forcing it through brute force. However, it is (and admits to being), just a first step that can and must be improved on by the repeated application, which will eventually tend itself towards brute force to achieve the speed to both read and write in a normal capacity.Excited to read the Kanji companion from Heisig, which made this book recommended. Uno de los mejores libros que han pasado por mis manos en mi época de japonés autodidacta. Usa el método mnemotécnico de la memoria imaginativa, siguiendo un orden específico para aprender el silabario.A mi me resultó realmente útil y ameno. This is the third book I finished this year, and it has really helped me a lot with my Hiragana and Katakana. I am surprised how fast it took me to go through all of it with your help, good job Mr. Heisig, I look forward to devouring your Remembering the Kanji books. really well written short stories, which help you remember how the symbol looks. The author uses the so called "primitives", simple images, which he puts in order to form the easy to remember story. That goes for the Hiragana, the Katakana and the Kanji book Heisig wrote. All of them brilliant. Great, now I can sound out my Sailor Moon manga and use context clues to figure out the complex story full of mature themes like shopping, losing weight, and falling on your goddamn face every time something surprises you. Great book and great methods. I wouldn't trust the pronunciation guide if you don't live in the States, though, as it is designed for US English. In combination with online pronunciation guides, you can learn both the hiragana and katakana in 4 or 5 days. There's a reason why this is the standard. I'd say more than 3 hours each, but no more than 7. Definitely one of the easiest ways to learn the Japanese alphabet. Excellent tool for learning the Kana.